Not a bad way to start a day. This is the favorite breakfast of our sous chef, taster cat. He would like it every day. For a really decadent and true-to-the-books experience, try pairing the breakfast with a dark coffee porter or stout. The beer goes with the medieval setting, while the slight coffee taste appeals to one’s morning psychology. Whisk the egg and milk in a medium bowl; add the cod and set aside to soak. Mix the flour, cracker meal, cayenne pepper and a pinch of salt on a plate. Cook bacon in a skillet until it’s burned black, and crispy. Remove from pan and keep warm. Heat 1 inch of oil in the skillet over medium-high heat. Remove the fish from the milk mixture and dredge in the flour mixture, turning to coat. Fry in the hot oil until golden, 2 to 4 minutes per side. Transfer to a paper-towel-lined plate to drain; season with salt and pepper. Serve up the bacon, fish, and bread. You can add other breakfast elements to taste, such as eggs, honey, etc. I had always read “little fish” to mean sardines, probably smoked. This, to me, fit more with the northern atmosphere, not to mention pairing well with bacon. Ooh, I like that suggestion. I’ll have to keep an eye out for some! You can probably find canned sardines easily enough, I see them all the time at the grocery store here in RI, for something fresher though I would check in Newport if you are ever down this way, my mom mentioned to me they had a fish market, but sadly, I have no clue where it is or even if it is still around. I agree with the sardines. if not the smoked, I’d settle for the salted (dried) sardines. I gather that sardines aren’t as easy to find as they used to be, at least in the US. Have you done the fried bread that is often served at breakfast? Do you think it’s like a Navaho frybread, or something like French Toast without the eggs? I was just wondering the same thing! I do ant to try the fried bread! If it’s anything like British fried bread, it’s basically sliced white bread that’s either pan fried or deep fried in oil – with the option of adding butter and/or bacon drippings for flavour. Not quite like Navajo frybread. if you make french toast, make it right. STALE bread. not stupid fluffwhite. Costco bread, kept three days. Hard as a rock. start with that, let the butter make it edible again. Think winterfell is short on salt? Smoked mackarel would also be something to try in place of the cod. Very similar to sardines, but meatier and heartier. Fabulously yummy! And what I think of every time I read that passage. when ever I read that passage I aways think of kippers as the fish. Here you can buy them in tins from any supermarket, and they go really well grilled, and served with fried bread for breakfast. Herring (kippers) is a traditional breakfast fish in Europe. Smoked kippers are delicious and about twice the size of normal sardines (not the ones you get in tins which are teeny tiny buggers). Anywhere that sells German food should sell tinned smoked herring filets. Delicious! When I think of fish for breakfast, it reminds me of pickled herring that I had when I was in Europe. I had them every day I was there. Delicious stuff. With that dark bread- I might even advocate for the sardines that come packed in mustard- for a little extra wake up zing. Mustard goes well with dark beer, too! IMHO, the best thing for this breakfast would be some kind of sweetwater roach, but fresh or frozen, not smoked. after gutting, small fish needs only a little of flour and is ready to be deep fried. it’s so delicate, that its bones became brittle and edible. what you lack in intensity, burned bacon will give you. Agreed, herring or kippers would have been more likely than sardines, which are likely too small to have just one or two, and cod is just not a breakfast item. Also, I can’t help but think the whole thing is rather silly, as you replaced half of the meal with whatever you thought was better. I wouldn’t call picking a type of fish changing half the meal. ;) GRRM usually doesn’t specify these types of meal components, so it’s up to us, and other imaginative readers, to fill in the blanks. If we were to do this meal again, which I would like, then we’d pick a couple of smallish fish such as kippers to replace the cod. However, given the number of new recipes yet to try, it might be a while! Sorry, I misread the egg part. I thought you added eggs as you suggested in the beginning of the article. I’ve had smoked cod for breakfast before, and it’s rather tasty tasty. To be more to the point I’ve been known to serve smoked cod in two different forms for breakfast. When I have the larger mid fillet pieces I break/flake them apart into nice bite size bits and cook them into a creamy omelette with baby english spinach. Or if I have the thinner tail end of the fillet I do a play on eggs Benedict and serve on either toast, muffins, or buttermilk pancakes with poached eggs and hollandaise sauce. Bread – good old fashioned farmhouse crusty bread, of course with it being an upper class household it would be made with fine milled flour and not the coarse wholewheat rubbish the lower classes eat. Little Fish – Kippers, oak smoked and dried ’til you could shod a servant in them. Soaked in white wine until they become soft as lambswool. Fried in butter to crisp them up and make them piping hot. The butter poured over the kippers when they are on the platter. Bacon – The side of pig will have been saltwater cured and oak smoked. Thick slices, each a meal itself to less weathy man, fried in lard in an iron skillet. When I was a kid I would go fishing with my Grandfather. We’d leave early in the morning, just after dawn and fish for maybe 2 hours. Big fish would be set aside for my Grandmother to deal with for dinner but any of our small catch, under 4″ trout, would be eaten for breakfast. We’d cook up bacon and then fry the trout whole (scaled and gutted) in the bacon grease. For the fish perhaps a smoked kipper would be an idea, that’s a fairly traditional fish for a breakfast and the smokiness would probably work with the bacon. When I read ‘little’ fish I could not help myself to imagine anything else than Whitebait. Whitebait is quite common in Cornwall – I cannot say anything about how popular it might be for breakfast, but it goes quite well with beer(like many fried things). My thoughts– a dark bread like pumpernickel is indeed the way to go. I made my own breadcrumbs the day before out of the pumpernickel as well. The breakfast is quite hearty, so one slice of the bread, fried in bacon drippings, was sufficient. “Two of those little fish” probably did refer to something small like sardines or herring, but I opted for a small trout fillet. A white fish like cod doesn’t seem right. Personally I’d have particularly enjoyed mackerel, but fresh mackerel is hard to find in inland areas where I live; the best you can hope for is canned in tomato sauce. 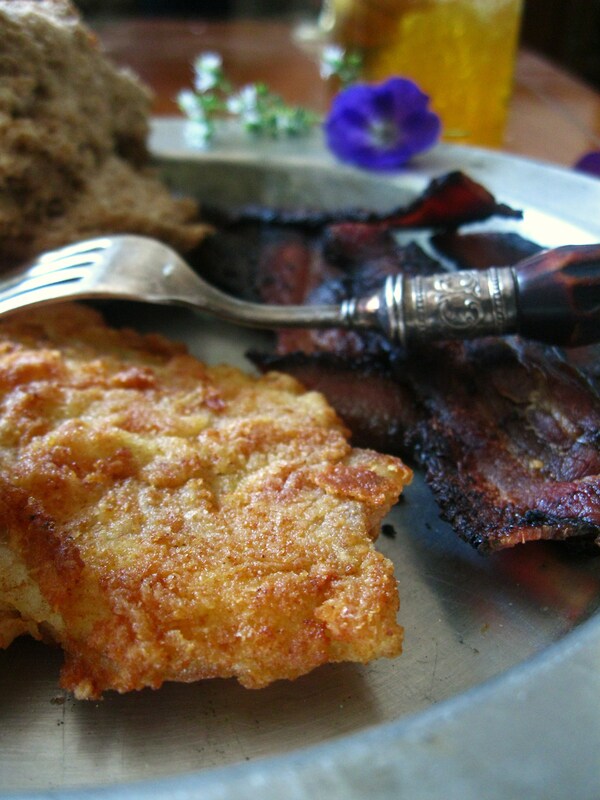 The trout breaded and fried up nicely, likewise in bacon drippings. Also, I substituted 1/4 cup of milk and 1/4 cup of beer instead; beer battered is always better. I really should have used a good, dark English ale or porter, but those are quite hoppy and bitter–not my first choice in the morning. Instead, I went with a more palatable German dunkel. Erdinger, specifically, but any of the common ones like Weihenstephaner or Schneider Weiße will do. Now that I think about it, a more bitter, Belgian beer like Leffe Brune may be a good halfway between the British and German beers. For the bacon, I used thick cut old fashioned slab bacon. Regular grocery store bacon does not do Tyrion justice. My own addition– a savoury porridge, made with a little garlic, paprika, and chopped steamed turnip. Just a small bowl, but a welcome addition. I also wanted to add a few boiled eggs, but this breakfast was getting quite full by this point. So as it turns out, my 2 year old is a big fan of Tyrion’s breakfast choices (sans beer of course). But this was yum! I baked the fish and used Dover Sole (seemed like something that would be commonly fished in the North) and it was really lovely.